One year ago: In that same historic room, another woman vanished without a trace. Her blood was everywhere…but her body was never recovered. Now: In the last month, San Antonio has become a dumping ground for battered bodies. All young women, many of them long missing, almost all forgotten. Until now. Texas Ranger Logan Raintree cannot sit by and let his city's most vulnerable citizens be slain. So when he is approached to lead a brand-new group of elite paranormal investigators working the case, he has no choice but to accept the challenge. And with it, his powerful ability to commune with the dead. 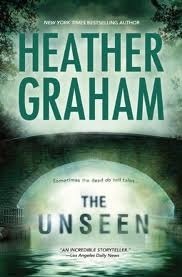 THE UNSEEN caught my interest immediately and held it tight until the stunning conclusion. The characters are wonderful and very realistic. The pacing is spot on as the reader is taken on a roller coaster of a ride as the team attempts to catch the murderer before more bodies are found. Having a federal unit consisting of members with ‘special’ gifts is not a new theme though most fit into the thriller/suspense genre. Ms. Graham has definitely added her own deft touch with the sparks that Logan Raintree and one of his team members Kelsey O’Brien throw off. Also the legend of the Galveston Diamond is so possible that I had to do a web search to discover whether it really does exist. I am happy to say that it doesn’t and is only a part of Ms. Graham’s wonderful imagination that she shares with her readers. I highly recommend it to any readers who enjoy their romantic suspense with a touch of the paranormal. Also readers who enjoy Kay Hooper’s Bishop series will want to check out this series. I rate this book a 3.8. ***I received this book at no charge from NetGalley in exchange for an honest review. No monies have or will change hands.